Every month, when Exclaim! *@# Magazine comes out, I go straight to the back of the issue. The Earshot Listings (The National Campus & Community Radio Report) are located in the back. The Top 40 most-played bands/musicians across Canada on Campus and Community Radio. I get out the pen or Sharpie and I start making check-marks next to the bands who’ve actually played Phog. It’s a great exercise. It reminds me of how much work I’m doing to bring in top acts…or how much MORE work is needed to get in bands and musicians I haven’t booked yet. Here’s a picture of this month’s chart. 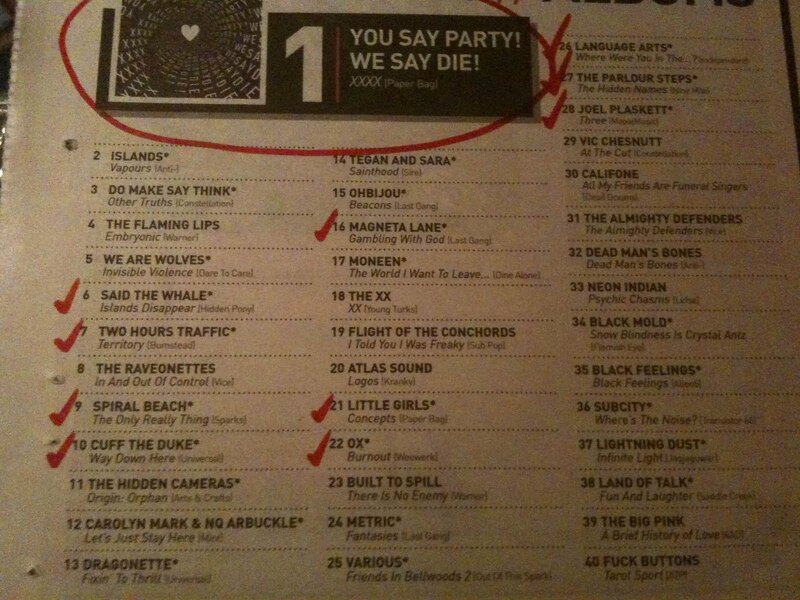 And a rarity for us, to have the number one band as one of ours, happened this month with You Say Party, We Say Die! making it to #1. Click on the photo to see a close up of our best bands…who are willing to play Phog (at one time or another). I heard that some jerk from Windsor also tabulates those !earshot charts too. Oh wait, that's me!